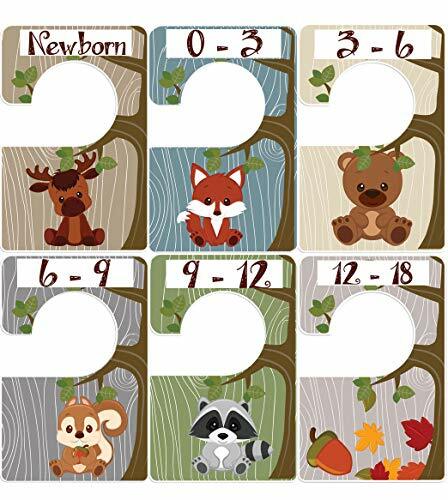 Woodland Animals 6 baby closet size dividers Closet Doodles by Digitaldoodlebug at Animal Backgrounds. Hurry! Limited time offer. Offer valid only while supplies last. These closet dividers will help organize your baby clothes! Made to work great in any closet these large dividers fit closet rods up to 1.5 inches. These closet dividers will help organize your baby clothes! Made to work great in any closet these large dividers fit closet rods up to 1.5 inches. Laser printed on high quality vinyl stickers. The plastic dividers are 5.25 inches high by 3.5 inches wide. These double sided dividers come to you already assembled with a sticker on the front and back. If you have any questions about this product by Digitaldoodlebug, contact us by completing and submitting the form below. If you are looking for a specif part number, please include it with your message.